Patrick Kluivert went abroad in the summer of 1997. The product of the Ajax youth academy joined AC Milan together with team-mate Winston Bogarde. After one successful season he was transferred by the Italian club to Spanish giants FC Barcelona for around 15 million euro. His period at FC Barcelona was his most successful stay abroad winning several trophies. With a short spell in the 2004-05 season at the Magpies, Kluivert signed a 3-year contract at Valencia in June 2005. He left England after an not so successful play in Newcastle. Also his Valencia season was not so successful season in Spain. In his second season, the coach showed no interests to put the player in his selection. There was a surprising return of Kluivert to the Netherlands with the transfer to current champions PSV at the end of the transfer period in August 2006. The 2006-07 season back at home was characterized by injuries but Kluivert played a set of matches in both Champions League and championship that ended with the Dutch Eredivisie trophee. His contract was not extended because his physical performances were considered to be weak. 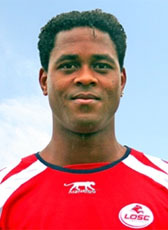 After his PSV season Kluivert signed a one-year contract at Lille on a free transfer until 2008. His contract in France was not extended at the end of the 2007-08 season. Kluivert says he was not ready to retire and was looking for new opportunities. Meanwhile he was for his coaching course on an internship at AZ with his former Ajax coach Louis van Gaal. Kluivert continued in the coaching staff of his former club PSV and was in the 2010-11 season one of the assistants of Wiljan Vloet at NEC Nijmegen. After NEC he joined the staff of the FC Twente Reserves until 2013. From March 2015 until June 2016 he was the national team coach of Curaçao. In July 2016 he was appointed as sporting director at Paris Saint Germain.